The time has come ....! The time has come for me to move on to my new pursuit! 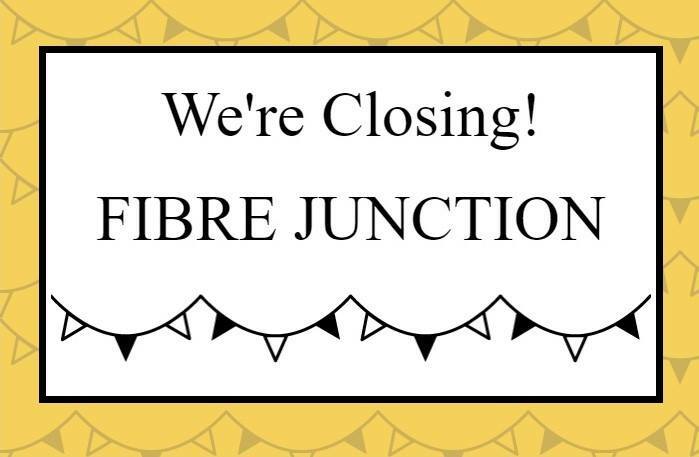 You can help me liquidate by visiting the shop, Fibre Junction, or shop online. All regular in stock items are 30% off. Minimum 1 yard cuts on the fabric. Shipping will be calculated based on total at regular price. Use code FIBRECLOSING. 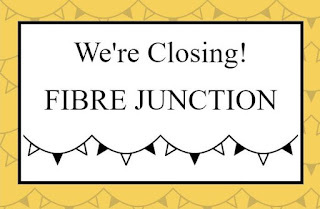 Thank you to all who patronized Fibre Junction. Learning from my mistakes ....! Hum ... When it comes to setting quilting goals, I seem to have a difficult time learning from my mistakes. I finished the quilt Bobbins, which is from that great book 12-Pack Quilts by Me & My Sister. You can read about the blog entry here. The quilt has been hanging on my design wall for a couple of weeks. Excuse the messy photo! I used fabrics from Chestnut Street by Fig Tree & Co - Available from Fibre Junction here. Below is a close up of the block. Late Sunday afternoon, I decided that I had enough motivation to machine quilt the top. The goal ... hit the sack once it was all machine quilted. By ... yawn ... 11:30 p.m. it was completed! Today's goal, machine sew the binding, making it ready for hand sewing! Another of my favourite part of quilting! Thank you for stopping by my little corner in cyber space! Catch you later! Cheers!